If you’re at all familiar with Adult Swim programming, you weren’t surprised to find that The Greatest Event In Television History turned out to be an 11-minute setup for a comedically mustachioed punchline. It’s a massive misdirect leading to the equivalent of a big-budget Funny Or Die video, as best buds and all-star human beings Jon Hamm and Adam Scott go through the fake motions to recreate the title sequence of the old CBS P.I. series Simon & Simon. But for all its laughs at the expense of showbiz hyperbole, unnecessary remakes, and questionable haircuts, the question remains: Does fictionalized Paul Rudd achieve his fake goal of crafting a shot-for-shot remake of Simon & Simon’s over-the-top, sax-and-bluesy-guitar-driven intro sequence? 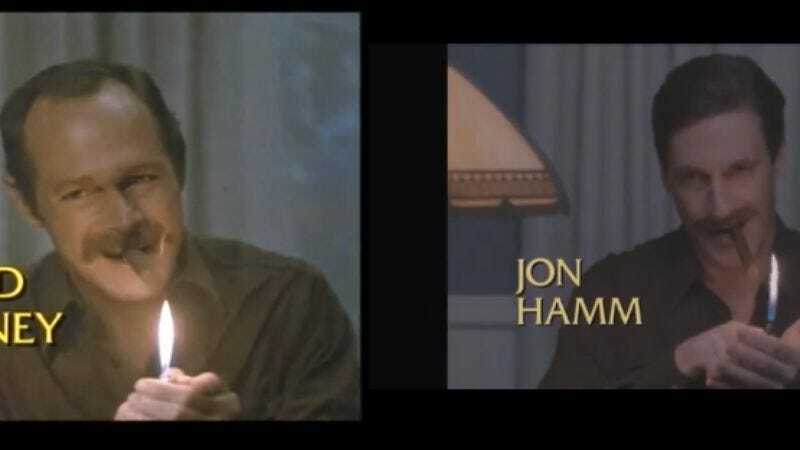 “As well as actual director Lance Bangs could without full access to original shooting locations, authentic props, or a real-live orca,” answers the YouTube Doubler user who uploaded a side-by-side comparison of these two miniature masterpieces of editing and TV-budget pyrotechnics. Some cues are missed and some action falls by the wayside—as they must, Gus Van Sant reminds Rudd within the alternate reality created by TGEITH—but it’s the commitment to the small details like Rick Simon bringing a hammer to a restaurant or the extras huddled behind Hamm’s bulldozer that elevate the special’s conclusion beyond the level of weirdly specific homage. And isn’t it worth all the hype just to see Don Draper pour a bunch of liquid out of a cowboy boot?